When it comes to having friends who are up high in the pop music world, the Blind Boys of Alabama are particularly blessed -- which may help the gospel singers' crossover dreams come true. Peter Gabriel is releasing the Blind Boys' new album, Spirit of the Century, on his Real World label. Bonnie Raitt and k.d. lang have recorded with the group. Anthony Keidis of Red Hot Chili Peppers has turned up at their shows. And Tom Petty invited the Blind Boys to join him on your with the Heartbreakers in 1999. The Blind Boys "did quite a few dates with us -- and they were just amazing," Petty says. "They shook the building every night. I sort of got fascinated with seeing if there was a crowd that they couldn't just absolutely slay. And it didn't really matter. Every night, they just tore the place up." Onstage, Clarence Fountain plays the charismatic front man as he mugs for the crowd. His voice is equally impressive, switching from tenor to baritone with east. Every Blind Boys concert culminates with group member Jimmy Carter running through the audience, shouting praises. Seemingly propelled by the Holy Spirit, Carter leaps high in the air as stage handlers try to restrain him. Then, James Brown-style, he breaks free of their grasp and continues jumping for glory. Like Gabriel, who signed the Blind Boys to his label sight unseen, Petty had never been to one of the group's shows when he invited them on tour. He had collected a few of their records starting in the late '60s. 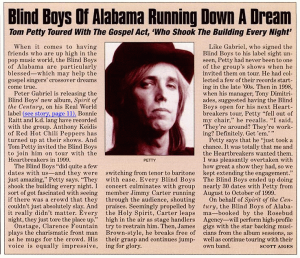 Then in 1998, when his manager, Tony Dimitriades, suggested having the Blind Boys open for his next Heartbreakers tour, Petty "fell out of my chair," he recalls. "I said, 'They're around? They're working? Definitely. Get 'em.'" Petty says that he "just took a chance. It was totally that me and the Heartbreakers wanted them. I was pleasantly overtaken with how great a show they had, so we kept extending the engagement." The Blind Boys ended up doing nearly 30 dates with Petty from August to October of 1999. On behalf of Spirit of the Century, the Blind Boys of Alabama -- booked by the Rosebud Agency -- will perform high-profile gigs with the star backing musicians from the album sessions, as well as continue touring with their own band.